Bedrock Communications are a Parrot Certified Installer. We supply and install the full range of Parrot Bluetooth handsfree kits. We can also install kits from other manufacturers. We also supply and install a range of dash cams, car audio and speakers. Our mobile engineer will come to your home or work to install and set up your product. We cover the whole North East of England, from Berwick in the Borders, down to Newcastle and Gateshead on Tyneside. For more information, or to make a booking, call our sales line on 01665 606006 or email enquiries@bedrockcommunications.co.uk. At Bedrock, we stock a range of guitars and accessories. We sell electric and acoustic guitars, bass guitars, starter packs, amps, strings, leads, tuners, straps, picks etc. We are now an authorised dealer for the excellent range of Vintage acoustic and electric guitars. We currently stock products from Tokai, Fender, Fret King, Encore, Ernie Ball, D''Addario, Elixir, Laka, Martin, Vintage, Danelectro, Palma, Pilgrim, Jim Dunlop, Behringer, Bohemian, Chord, Rotosound, Kinsman, String Swing, Hercules, Shubb, Guitar Man, Wilkinson, Guitar Tech, Snark, Quik Tune and many more. We also buy and sell second hand guitars. Pop in and see us, order online or call us on 01665 606006. Prices and stock last updated 29th March 2019. 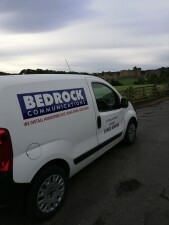 Welcome to ‘Bedrock Communications’ we are a mobile phone, car audio and music retailer based in Northumberland in the North East of England. Established since 1993, we supply to the public and to trade customers. As well as our online store, we currently have a retail shop located in the market town of Alnwick and an installation workshop in Morpeth. Our shop stocks a wide range of mobile phones, accessories, handsfree kits, sim cards, pmr & cb radio, cd/tuners, amps, speakers, car audio accessories, guitars and amplifiers.